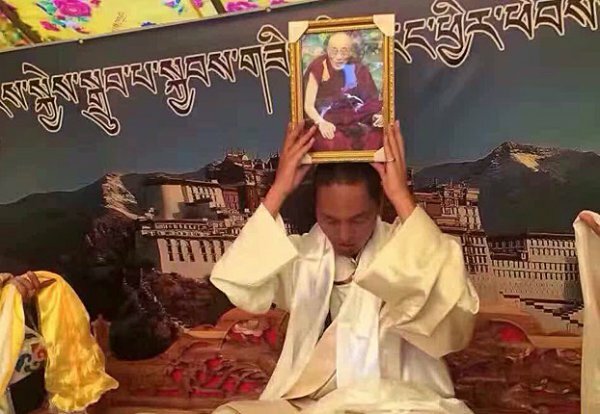 After four years in prison, Gangkye Drubpa Kyab had been welcomed by friends and relatives with a traditional Tibetan reception when, following the celebration, he was ordered to report to the local police and detained once again. The well-known writer was told to change his thoughts and to embrace the official political line of the Communist Party of China. He will be held into custody for at least 15 days, leaving friends and family extremely worried of his fate. Gangkye Drubpa Kyab, 36, had been confined in Sichuan’s Minyak Rangakha prison for “instigating campaigns for Tibet” before being freed and sent back to his home in Serthar (in Chinese, Seda) county on Sept. 16. “On his release, his relatives and friends welcomed him with a grand reception in traditional Tibetan dress and including the presentation of ceremonial offering scarves to a portrait of [exiled spiritual leader] the Dalai Lama,” a resident of the area told RFA’s Tibetan Service on Friday. Kyab was then ordered to report to the local police, RFA’s source said, speaking on condition of anonymity. “When he arrived at their office, he was again detained and has not been allowed to go home,” the source said, adding that officials informed Kyab he would be held for at least 15 days. “They warned him that if he does not change his thoughts and embrace the official political line, he could be thrown back into jail,” he said. Kyab is now being held at the Serthar county detention center, a second local source told RFA. “His relatives are now worried about him again because they see the authorities bullying an innocent Tibetan who has committed no crime,” he said. Kyab, a well-known writer in Tibetan areas of Sichuan, was first taken into custody on Feb. 12, 2012 by police from Kardze (Ganzi) prefecture and Serthar county, and was later sentenced by a court in Nyagchukha (Yajiang) county for “instigating campaigns for Tibet,” a local source told RFA in an earlier report. A native of Gephen village in Serthar’s Raktram township, Kyab had taught children in two different schools in Serthar, RFA’s source said.